The teacher, who is the citizen of the US, told me about his experiences of living in China. He lived in Harbin which is located as he said ... on the head of the chicken. Everyone knows that Italy is shaped like a boot. 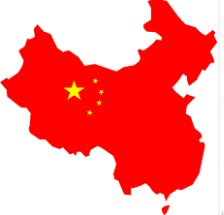 And if we looked at the Chinese map precisely. China's borders make it shaped similar a chicken, there is even an island on the south of the mainland which could be an egg. As he said, living in China can have completely different experiences depending on if you are living independently, or if there's Chinese people living with you, or your boss is Chinese, or your landlord is Chinese, or if you live in a building with only foreigners. Local expect to live their own life. In his opinion, since 2006 the life has changed rapidly. New President, revision of economic politics made life in China different compared to how it was before. Chinese feel as they are above foreigners. Even sometimes they looked arrogant. The teacher mentioned Fucjian, the closest province to Taiwan. It's known for good food and interesting people that are very different from a lot of other Chinese. Nevertheless, he never recommends living in China. I kept in mind his opinion but the trip to China stays in my list of planning deals.